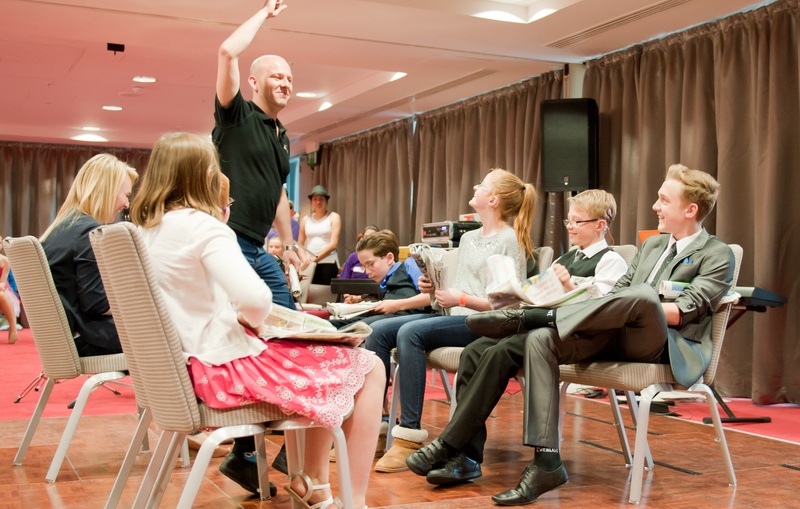 Sunday 24th and Monday 25th May 2015 saw the first ever ‘Raising the Bar’ event held at the Birmingham Repertory Theatre (REP) for young deaf people with exceptional skills in music and dance. A huge nationwide competition was held to select participants. 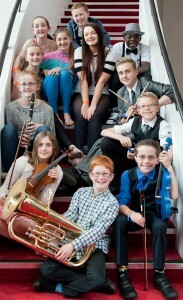 Six musicians and six dancers between 8 – 16 years old were chosen through a tough selection process which involved submitting an audition video along with a written application form to win an opportunity to showcase their talents, meet like-minded peers and learn from music and dance professionals currently working in the arts industry. The event was set up by the National Deaf Children’s Society (NDCS) with an aim to recognise and support the music and dance skills of the lucky winners. They would also feature in a film which aims to increase awareness, accessibly and participation in the arts. This in turn,hopefully would raise expectations of what the 45,000 deaf children and young people all over the UK can achieve today. Myself and Danny Lane from Music and the Deaf plus Billy Read and Ava Blake from Defmotion, the UK’s only turning deaf dance crew were invited to meet and mentor these young deaf people over the Bank Holiday weekend by leading masterclasses, providing one to one tuition, giving tips, support and encouragement building up to the final showcase. At the first meeting Danny and I delved straight into talking with the 6 budding musicians about our background, what we liked about music and also about our individual levels of hearing loss. We then asked the musicians to tell us about themselves. It was a discussion out in the open to allow all of us to understand where they have arrived, what aspirations they have, also sharing their own personal challenges with music and whether it has anything to do with deafness. It was very clear that first and foremost, their passion and the right to learn to play a musical instrument is what they strive for. “Well….why not?” they say. Some of them were from a musical background or from schools that actively promotes music activities. For some of them it was the appeal of the instrument itself, for example 12 year old Adam Butler likes belting out the drums! Nine year old Thomas Bratton with moderate hearing loss in both ears plays grade 4 pianoforte and the Euphonium has dreams of entering the ‘BBC Young Musicians for the Year’ competition. 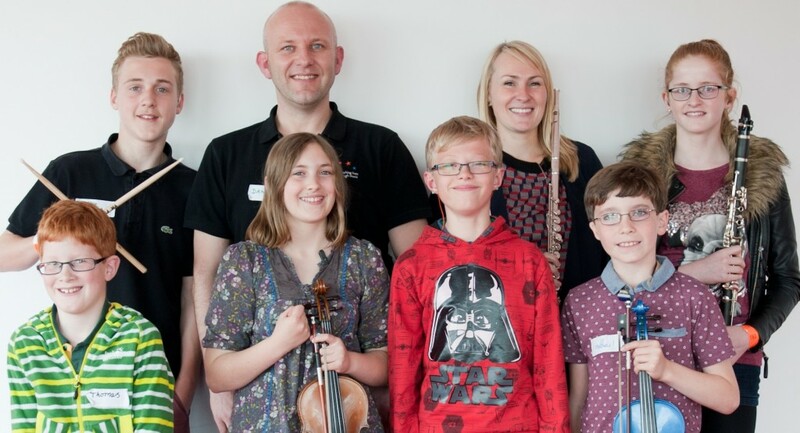 Profound unilateral deafness did not stop ten year old violinist Sophie Wiseman from being awarded a scholarship to Wells Cathedral School in Somerset. This is historically known as one of Britain’s five top specialist music schools, which takes some of the finest young musicians in the country. This shows that each and every one of them has a vision for their future. During our discussion, it was clear that support and encouragement from families and teachers are PARAMOUNT in helping them become young stars – a vital and contributory factor to their success. 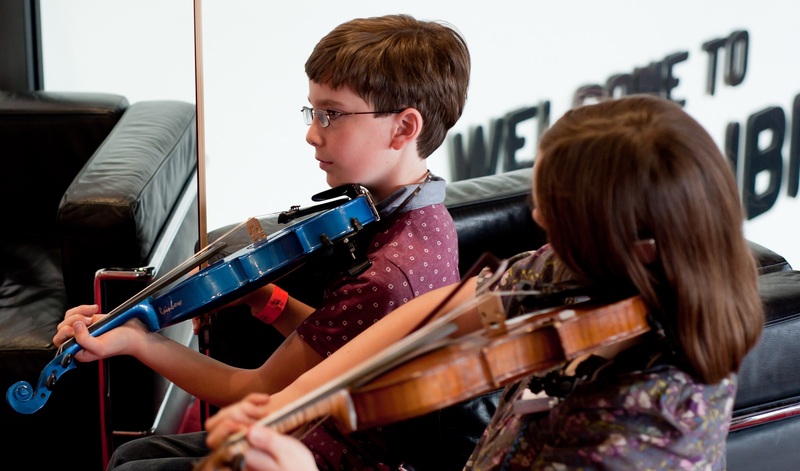 This means being able to own a good quality instrument, access to reading music, attending regular and weekly fee-paying lessons, establishing a practise routine and for some, taking on ensemble making opportunities. Although they all have various degrees of hearing loss and wear hearing aids or cochlear implants on either one side or in both ears, they all have access to the world of sound. 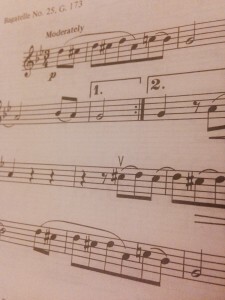 Paradoxically, I should stress that they are all very strong readers in music; by having a reliable pulse, good rhythmic capabilities along with the correct handling of their instrument enables them to become a musician. All this stems from having a passion to play music, having good support network and regular lessons. While Sophie is a competent and a skilled violinist, she often feels that her hearing loss sometimes brings on extra challenges of working with her orchestra. Although she wears a BAHA headband to enhance her hearing, she has the lip-reading of the conductor to watch out for, and instruments doing different things and working out where sounds are coming from. 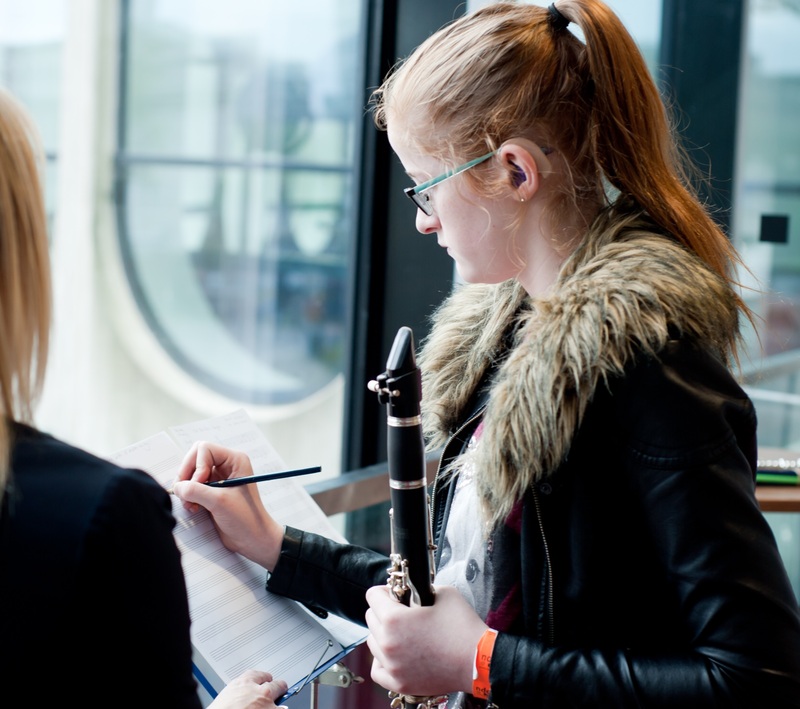 We discussed that communication is the key in informing the conductor and playing members in making sure they face Sophie when they are talking and for Sophie to study the whole orchestral score if possible, highlighting any rhythmic sections by other instruments so that she can localise sounds. I’ve done this myself before and understand the issues. Soon after our chats we got our instruments out and went straight onto the business of making music. We explored ways of exaggerating with dynamics (loud and softness), expressions, projection of sound, ideas, and tempo. 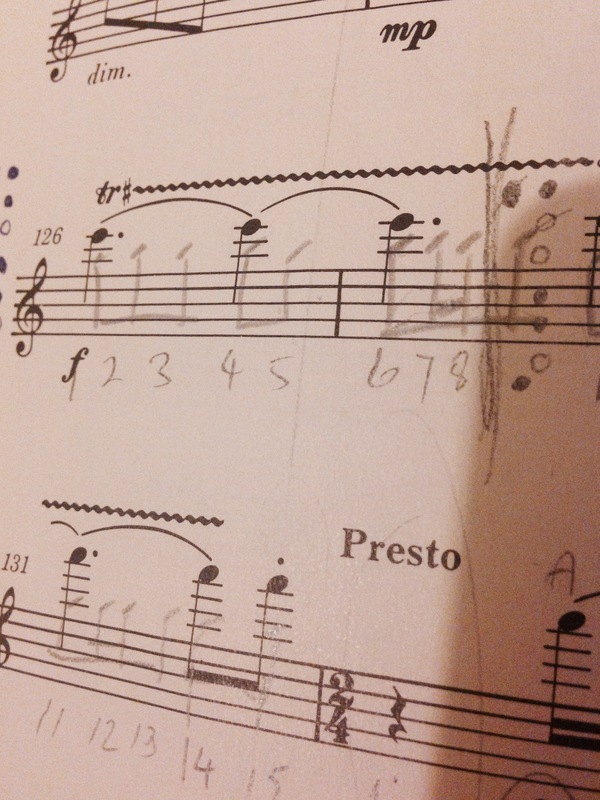 We looked at what makes a good piece to listen to (and bad!) and what demonstrates a good performer. There were a lot of fun acting and try-outs, thinking of ways to ‘bring’ out our pieces in preparation for the showcase. 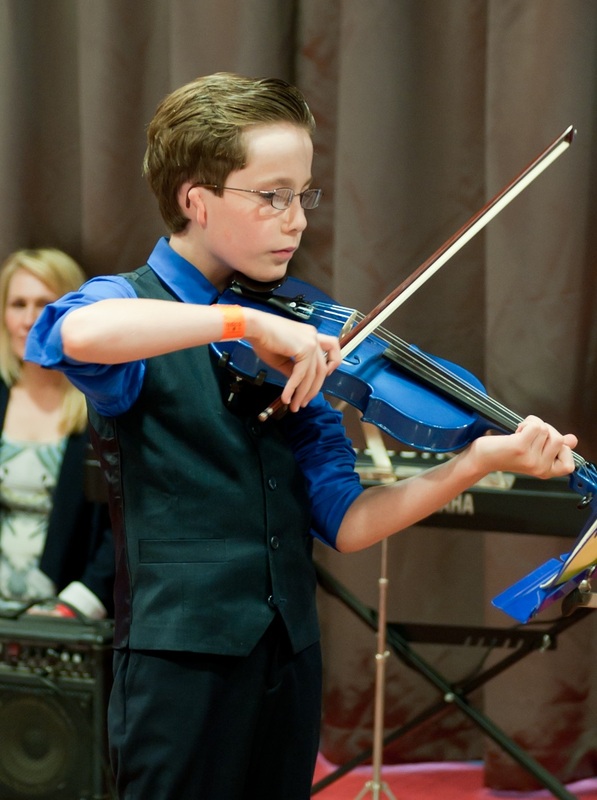 For example, as soon as Matthew a 9 year old violinist with microtia atresia learned the words of ‘Annie’s Song’ by John Denver, the phrases shaped beautifully with expression. The singing sounds came out like magic and I had goose bumps. He made a very special grand opening of this tune at the showcase. One of the things about being a musician is not only that we spend time practising a lot in solidarity, but playing in a group of other musicians too. Danny and I gave them all a challenge to think about what sorts of sounds they can make with a single newspaper. Very quickly they showed us scrunching, ripping, waving, smacking, shaking, rolling, tearing papers up quickly and slowly, flicking, stamping it, opening/closing the paper and so on. It was the soundscape and creative ideas we were most interested in and then we turned it into a ‘Newspaper Orchestra’. We had a theme of being a passenger in the underground. I was blown away by their ability to create polyphonic, overlapping rhythms with syncopations, along with a strong sense of pulse, as well as all watching each other for cues in pattern, dynamic and tempo changes. We performed this again at the showcase and Matthew suddenly took out his violin just before the end to play ‘Happy Birthday’ to his mother who was in the audience. There was not a dry eye in the room. He said that sometimes in the underground train there are buskers about. The Newspaper Orchestra finished on high literally by throwing all the papers up in the air. After lunch Danny suggested that we set up a band using our instruments to play 12 bar blues, a jazz inspired ‘Boogie Woogie’. They were also given an opportunity to learn how to improvise in pairs or on their own. Their reaction at first was “What? Impossible!” and “I’ve never done it!” but they were surprised at how they were able to do it when given a group of notes to work on. 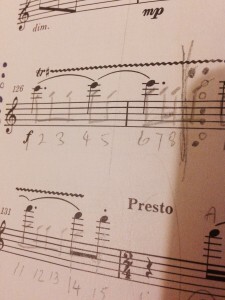 Some of them played from memory, and others had it written out. Either way they all gave it a try and demonstrated really impressive ideas. We practised our parts then worked together. In our band we had we had 2 violins, 1 flute (me), 1 clarinet, 2 pianos and a full drum kit. I have to admit at first we all kept falling out of time and it became an issue we needed to address. One might have thought that after the Newspaper Orchestra we would be glued together timing-wise, but I think the pitch sounds and the technical demand of the instruments all added to the listening and watching challenge. Concentration was higher as well as following each note and rhythms in time was another thing. Although listening to everyone is important, we had to be reminded of eye contact and watching Danny who was conducting to keep in time. Adam on the drums had a main role of keeping a steady beat to keep all of us in time. After a lot of repeated practise, we finally developed a wonderful sense of security as a performing unit and eventually felt independent enough from watching the conductor too. It was all a matter of time, practising and working together as a group – I knew we would master this activity and achieve this the next day at the showcase. Finally the two groups of dancers and musicians got together to rehearse as one on the last day. As I had been so busy with the musicians, it was a delight to sit and watch the dancers perform with such energy and grace. Some of them are from a dance company, whereas for some they simply have a passion for dance. They all displayed a range of styles, from street, hip-hop, ballet and contemporary dance. They were either guided with the music playing in the background or led by their own performance expression. 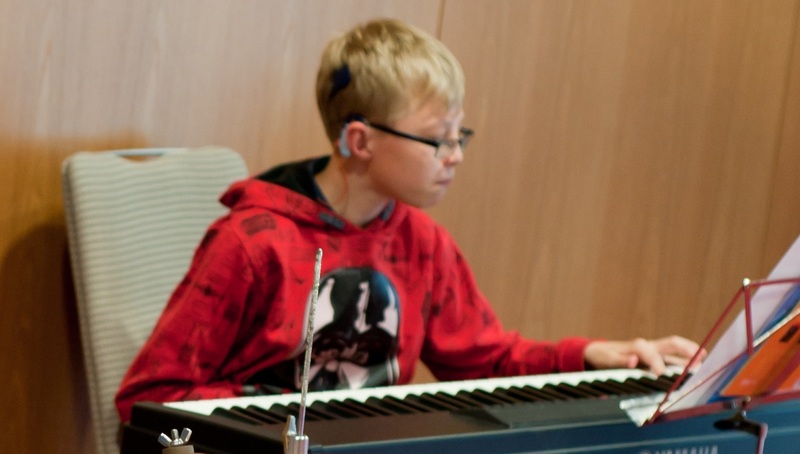 On the music side of things, I must say that I was in awe with 11 year old Keir Fenton’s super expressive piano playing with the ability to release and pull back his performance piece. Although he is profoundly deaf with cochlear implants he showed that it comes from ‘feeling’ and ‘colouring’ the music in his own way. I was not surprised to learn that he was awarded distinction in his recent piano exam. 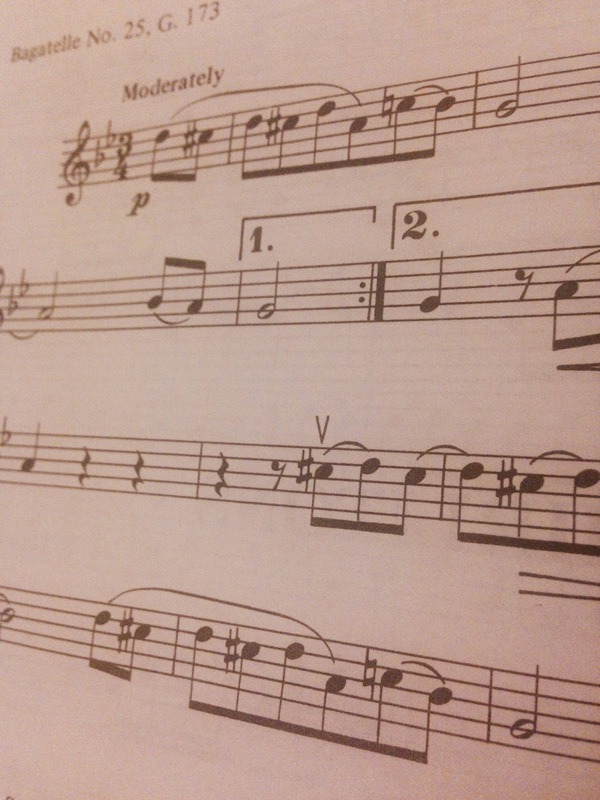 Elizabeth Sadler played her clarinet with such lovely vibrato which added warmth to her piece. I know that as a wind player this is something that can take a long time to attain this but it seems to come naturally to her. She played with a piano accompanist and showed really good stage presence although I knew how nervous she was feeling beforehand. Thomas Bratton played the lively Blackadder theme tune on the Euphonium with enjoyment. He was visibly enjoying himself and totally immersed in the music which rubbed off on the audience present at the concert. 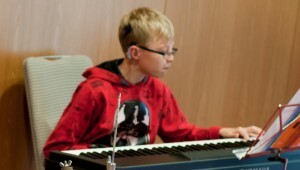 He also demonstrated creative ideas while improvising from memory when playing Boogie Woogie on the piano with the band. Although I did say that Adam with moderate hearing loss likes to ‘belt’ out on the drums, he actually showed a sensitive side. He can alternate from softness with a delicate touch and be soothingly slow to a swift change in higher dynamics and playing energy. 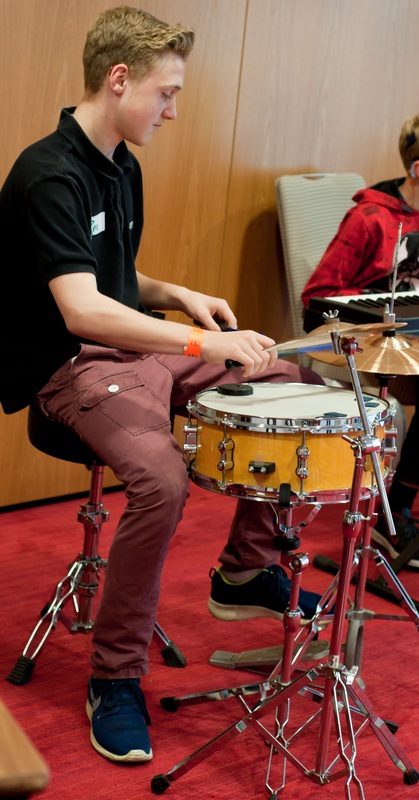 He showed us his versatility which is essential for a future professional drummer. Sophie was a show-stopper; she performed her Rieding Concerto in G with an accompanist with such virtuosity, expression and a passion to share her music with everyone in the room. 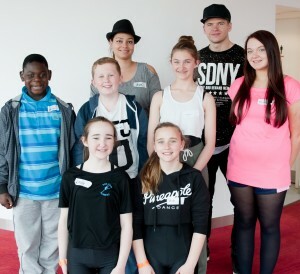 During masterclasses she was very supportive and encouraging of her peers and they all looked up to her. I also have to say that the NDCS volunteers’ support during the two day workshops have been second to none. The showcase was a magical and an uplifting experience. The music and dance performers were a joy, each of them bright, committed and gifted in their own individual and special ways. It is clear that expressive arts allow them to blossom as individuals with unique personalities. The professionals in the mainstream arts industry only needs to support and believe in them and provide them with every chance that they can give to continue to thrive.